I’ve been playing around with Angular.js for the last long while and for the life of me, I could NOT get my Angular apps to launch in IE9. They all work fine in IE11 but IE9 would just show the curly braces and similar bits. I searched around and couldn’t find anyone complaining about his problem. It worked fine in Chrome, IE11, just not IE9. That error had me thinking there was some problem downloading the angular or other libraries that I needed. As it turns out, this was not the issue. Well, that didn’t work for IE9. Instead, I wrapped all the rest of the HTML in the <body> inside a div and references MatrixApp that way. My colleague, Javed Ansari (http://www.bigapplesharepoint.com/team?showExpertName=Javed%20Ansari&rsource=pgblog), wrote a short summary blog post on frameworks he likes or at least has been using with with SharePoint: http://www.bigapplesharepoint.com/pages/View-An-Insight.aspx?BlogID=53&rsource=PGBlog). jQuery seems to have been the victor on the field, so to speak, for years now, but the others are more new and stills sort of battling it, like Angular. (SPServices, of course, has been a life saver for years and will continue to be so I think). What are people using? Are they focused more on Microsoft’s tooling (CSOM / JSOM) or moving more toward Angular, Knockout, Ember, etc? I have a growing bias toward these non-Microsoft frameworks. I think the MSFT stuff is harder and harder to work with, requiring almost as much of learning curve as old-style server-side dev. Post a comment here or over at Big Apple SharePoint if you want to discuss (Big Apple will have more likelihood of a good discussion). 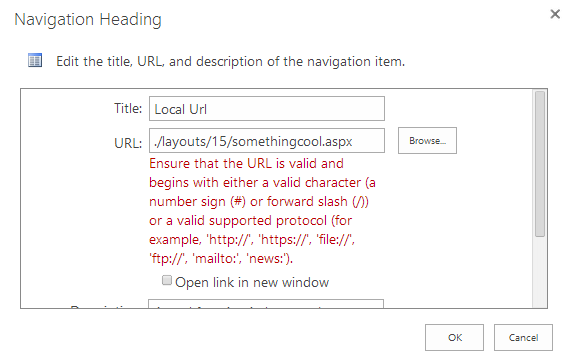 Ensure that the URL is valid and begins with either a valid character (a number sign (#) or forward slash (/)) or a valid supported protocol (for example, ‘http://’, ‘https://’, ‘file://’, ‘ftp://’, ‘mailto:’, ‘news:’). “Blech and pox!” I said. 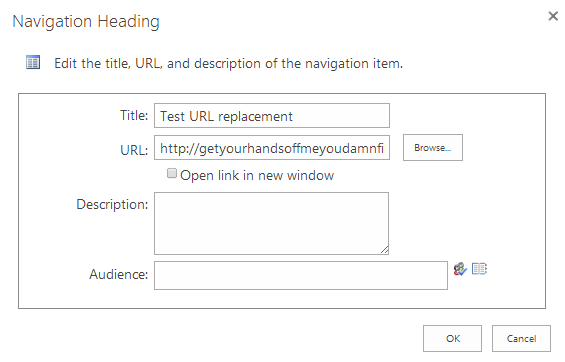 The jQuery selector finds every <a> tag that has “Test URL replacement” in its name. You may want to find-tune that depending on your link and such. 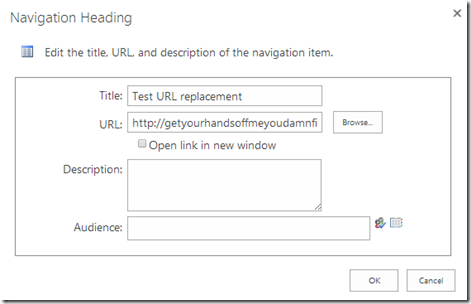 The .click(function() overrides whatever SharePoint would have done when the user clicked. Make sure you “return false” or else it will do your stuff and then try to the href thing too, which is almost certainly not your goal. 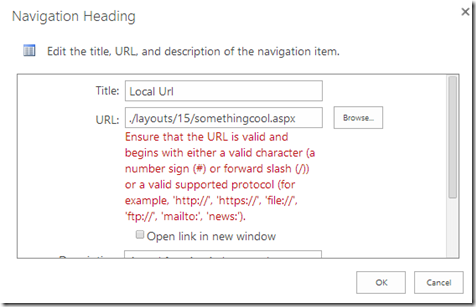 This was done and test in a SharePoint online environment but should work well in 2010 and earlier too. I’ve been working on SharePoint intranet site for a client that features, among other things, a stylized secondary navigation whose menu options are managed via a regular old custom list. The idea is that the client gets to control “their” site’s menu without affecting or being affected by the global navigation put out by IT. The sore spot here is that every time anyone hits one of the site’s pages, that user’s web browser is reaching out to get items from the list. Once dev is complete and testing has proven things to be stable and complete, this call is unnecessary more than 99% of the time since the menu rarely changes. It also has a weird UI affect which is common in this brave new world of hyper-ajaxy web sites – the page renders and only then does the menu render. It’s jittery and distracting in my view. And jittery. So, caching. If found, render it immediately. Don’t wait for the page to finish loading. (You need to make sure your HTML is strategically placed here, but it’s not hard to do). Some of you are going to say, “hey! there’s no real caching going on here since you’re reading the menu anyway every single time.” And you’re right – I’m not giving the server any kind of break. But because the call is async and happens after the page’s initial HTML payload fully renders, it “feels” more responsive to the user. The menu renders pretty much as the page draws. If the menu happens to the change, the user is subjected to a jittery re-draw of the menu, but only that one time. Put in a rule that the “cookie cache” is valid for a minimum of 24 hours or some other timeframe. As long as there is no expired cookie, use the cookie’s menu snapshot and never hit the server. Well … that’s all that come to mind right now :). If anyone has any clever ideas here I’d love to know them. And lastly – this technique can be used for other stuff. This client’s page has a number of data-driven things on various pages, many of them changing relatively rarely (like once a week or once a month). If you target specific areas of functionality, you can give a more responsive UI by pulling content from the local cookie store and rendering immediately. It feels faster to the user even if you’re not saving the server any cycles. You can save the server cycles by deciding on some conditions and triggers to invalidate this local cookie cache. That’s all situational and artsy stuff and really the most fun :).